Stir-Fried Beef with Black Pepper + Anolon/Cookbook Giveaway! How did the summer fly by so quickly? It seemed like only yesterday that I was looking forward to Memorial Day picnics and plugging free summer movies and concerts into my Google Calendar. Where did the time go? What happened to my summer reading? Why have I not taken more beach trips? How have I not once used my ice cream maker that's taking up precious cabinet space, for the 4th year in a row? You can see how fall would inspire an existential crisis. Harrumph. Onward and upward, I guess. A few weeks ago, Kian Lam Kho from Red Cook asked me to take part in his Mid-Autumn Festival Blog Feast to celebrate his cookbook Phoenix Claws and Jade Trees. This gorgeously photographed book is a comprehensive tome on Chinese cooking techniques (think the Chinese version of Mastering the Art of French Cooking.) I was more than happy to oblige, fantasizing about the amazing red cooked pork from his book that I was going braise on the stove while sipping apple cider, as the crisp fall air—scented with pumpkin spice or something—circulates around my apartment. Well, I was wrong. Just cuz Labor Day came and went does not mean the weather catches up. In terms of weather, we're still in the midst of summer in NY, and my AC is as wonky as ever. Braising will have to wait for another day. Luckily, there was this stir-fried beef with black pepper recipe. It was fast, hearty, and made ample use of oyster sauce for an abundance of earthiness. The recipe also called for a generous amount of coarsely ground black pepper, which is used as a spice rather than a seasoning in Chinese cooking. I made a few minor tweaks to the recipe, such as using hangar steak instead of beef tenderloin that it called for because my local butcher had it today and the marbling looked too good to pass up. Flank steak is another good option. Recently I estimated that over the past 8 years, I've taught close somewhere between 400 to 500 cooking classes. (And I don't even want to think about how many dumplings we've made in all those classes!) And whenever I teach, the most common questions I get from students are about where to buy ingredients around the city and the best brands to get. Navigating those grocery store aisles for unfamiliar ingredients, sometimes with dozens of varieties for something like rice vinegar, can be a very daunting task. So in the past few years I've begun emailing students a resource list with good stores for Chinese ingredients (with links to addresses), some of my preferred brands for the ingredients, and recommended Chinese restaurants around New York. While most of the list is New York-specific, I hope that those of you who live outside the city can make use of the recommended brands section to find these ingredients closer to where you live. I will be continually updating this, but feel free to make suggestions for your own favorites! A while back I was contacted by cookbook author Molly O'Neill and Cosima Amelang, who are both organizing this year's Longhouse Food Revival, a weekend-long gathering of food writers, cooks, farmers, and artists in upstate NY. This year's theme, I'm excited to share, is Chopstick Nation, on the Chinese American experience in food. And I'm inviting everyone to take part in a recipe contest. We are collecting your own takes on 6 Chinese-American comfort food favorites and they will be featured in a presentation I'm giving on Sept 12th to a crowd of leading food writers, chefs, and makers and shakers in the food work . Send us your recipe by September 3rd; winners will received either a KitchenAid Stand Mixer or a Wüsthof Classic 7-Piece Block Set. Who says you can’t do take-out at home? Cook your way to victory and top-notch prizes by creating your own take on Chinese-American classics. Get started by choosing a dish from the list below and get cooking. We can't wait to see your submissions! Submit your recipe and fry, braise, and steam your way to fabulous prizes! Winners will receive a KitchenAid Professional Stand Mixer or a Wüsthof Classic 7-Piece Block Set. Send submissions (recipe + photo + submission form) via email to: cosima@cooknscribble.com by September 3. Results will be announced after Sept 3. Big thank you to our wonderful sponsors KitchenAid & Wüsthof! Stay in the loop with regular updates from the judging panel on our Facebook page, Chow Mein LIVE. Thank you to our wonderful sponsors KitchenAid & Wüsthof! New Online Cooking Class launched with Craftsy! So...some exciting news! Two months ago I traveled to Denver to film an online class series with Craftsy on making favorite Chinese restaurant dishes at home. Because I'm frequently asked by readers who live outside NY about classes away from the city, this was the perfect way to reach home cooks all around the country and the world. After a ton of work prep work, filming, and post production review with the wonderful team in Denver, I'm happy to announce that Chinese Takeout Favorites, my very first online course, launched last week. In this course, you'll learn as much as you would learn if you came to 4 or 5 (!!!) of my NYC classes. Instead of haphazard online learning such as Youtube videos on random dishes here and there, you'll get a comprehensive set of lessons I designed, grouped by categories. You'll learn a range of new techniques and how to apply those techniques to different variations of classic dishes. We cover egg roll making, wonton wrapping, stir-frying like a superstar, soup making, secrets to perfect noodles, and much, much more. I am also available to answer any questions you may have in the interactive forum. You'll have access to the lessons for life and can refer back to the videos any time you'd like. 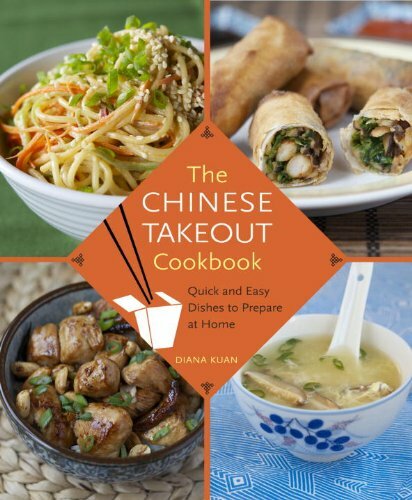 By the end of the lessons, you'll have the skills to cook many complete meals at home, or even pull off a full Chinese dinner party with pizzazz. And as a bonus, for the rest of July you can use this exclusive link for $20 off (50%!) the class. I hope you enjoy the class and pass this along to any friends or family who would like to take a full-on Chinese cooking course from the comfort of their own homes!